Amazon’s Echo line of connected speakers continues to grow. So far in 2017, we’ve seen the introduction of the second-generation Echo, Echo Plus, the style-conscious Echo Look, and top-of-the-line Echo Show. 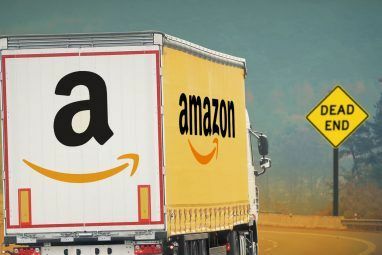 And Amazon isn’t done just yet for the year. The Echo Spot is the latest unique device to feature the Alexa voice assistant. With just a simple voice query, users can accomplish a huge number of tasks. Anything from playing music to controlling smart home devices and much more is just an Alexa command away. Let’s take a look at the Echo Spot and how it fits into Amazon’s lineup. We’ll also highlight some of its unique features so you can decide whether it’s the Alexa device you’ve been looking for. What Is the Echo Spot? As you probably can tell, the biggest draw of the Echo Spot is its round, 2.5-inch touchscreen. The overall design looks like a marriage of the Echo Dot and high-end Echo Show Seeing Is Believing: The Amazon Echo Show Review Seeing Is Believing: The Amazon Echo Show Review Does a voice assistant speaker really need a touchscreen? The $230 Amazon Echo Show certainly makes a compelling case, with video flash briefing skills, song lyrics, and on-demand streaming of supported security cameras. Read More . Weighing 14.8 grams and measuring 4.1 inches wide and 3.8 inches tall, the front of the Show features the front-facing camera and touchscreen. The speaker grill is on the bottom. On the back, you can find the volume control buttons, the microphone and camera on/off control, four-microphone array, power port, and 3.5mm output to hook up to a larger speaker. Buyers can select from a version of the Echo Spot with a white or black casing and border. You can also purchase an optional adjustable stand for the Echo Spot to adjust the screen angle. It’s available in the same two colors: black and white. It shouldn’t come as a huge surprise, but the Echo Spot will provide anyone access to the huge number of voice-controllable skills. Currently, there are more than 20,000, and that number is growing daily. While some of those aren’t exactly helpful Let's Face It: Amazon Echo's Alexa Is Stupid Let's Face It: Amazon Echo's Alexa Is Stupid There's no doubt voice-controlled assistants are the future, but is Alexa the solution? Perhaps not. In this article, I'm going to argue Alexa is actually rather stupid. Read More , there are some truly useful options you can take advantage of, just by saying “Alexa.” But the biggest draw of the Echo Spot is the combination of screen and camera. A unique feature, not found on the larger Echo Show, are a number of different clock faces users can select from. The 12 faces include a number of digital and analog options. 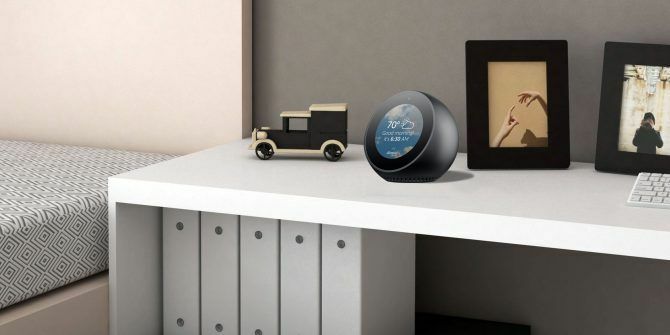 Since one of the places Amazon hopes you’ll use the softball-size Echo Spot is on your nightstand, that definitely makes a lot of sense and could easily make the device a popular (and powerful) modern alarm clock. Interestingly, there is no physical snooze button, but you can turn off an alarm by using an Alexa command or just tapping the screen. The screen shows anything that its bigger brother can handle, like displaying song lyrics and other skills enabled for a touchscreen. A big downside though is that since the Echo Spot’s screen is small and round, some video content will be optimized to fit the space and only focus on the center of the action. So while you’ll actually be able to play video from Amazon and other sources, the experience won’t be optimal and something akin to watching TV with a monocular. The camera also allows users to video chat with any other Echo Show, Echo Spot, or Amazon Alexa smartphone app user. Because of this, it can be used as part of the Drop-In Feature. Anyone with the Alexa app for iOS or Android or another Echo Show or Echo Spot, can drop in and immediately view and hear what’s in range of the camera. This completely optional feature needs to be enabled by both parties on a per-contact basis, but can be useful in a number of situations. And for the first few seconds of a drop in, the screen will be fuzzy so the other party can decline the call outright or just switch to audio. You can also use the Echo lineup’s voice calling and messaging How to Use Amazon Echo's Voice Calling and Messaging in 3 Easy Steps How to Use Amazon Echo's Voice Calling and Messaging in 3 Easy Steps Your Amazon Echo device and Alexa have been busy learning some new tricks. Long requested by users, messaging and voice calling adds yet another layer of usefulness to the enormously popular voice-activated speaker. Read More feature. Another place the Echo Spot’s screen will shine is when controlling a smart home. The Echo line has easily become the easiest and most wide-ranging way to control an ever-growing number of smart home devices. Smart devices from lights to locks and everything in-between are more than likely controllable with an Alexa command. With the screen, users will be able to view live feeds from a number of different surveillance cameras and smart doorbells from manufacturers like Nest, Ring, August, Arlo, TP-Link, EzViz, and others. You’ll just need to say “Alexa, show me the [name of the camera].” Just like on the Echo Show How to Set Up and Use Your Amazon Echo Show How to Set Up and Use Your Amazon Echo Show Just purchased a new Amazon Echo Show? Here's a step-by-step guide for everything you need to know to get it set up and working perfectly! Read More , that feature alone could help be worth the cost of admission. One big word of warning is for anyone looking to play music on the Echo Spot. 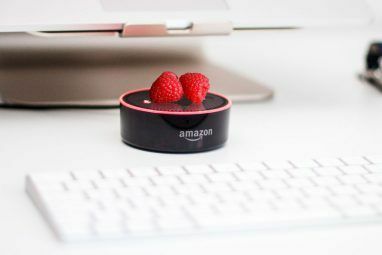 Since the device is similar in size to the Echo Dot How to Set Up and Use Your Amazon Echo Dot How to Set Up and Use Your Amazon Echo Dot Just got an Echo Dot and need help setting it up? We'll show you how to set up your Dot and explain everything you need to use it, plus troubleshoot common problems. Read More , don’t expect to use the Spot itself for a high-quality audio experience. Only sporting a 1.4-inch speaker, you should definitely expect to attach another larger unit via a 3.5mm Aux cable or through Bluetooth if you’re serious about music and great audio. Like other Echo devices, you can stream music from a wide variety of sources like Amazon Music Amazon Echo Owners: Spotify Premium or Amazon Music Unlimited? Amazon Echo Owners: Spotify Premium or Amazon Music Unlimited? Amazon Echo owners have a myriad of ways to listen to music, including Spotify Premium and Amazon Music Unlimited. So we have put the two to the test specifically on Amazon's smart speakers. Read More , Spotify, Pandora, and others. Another Echo That Hits the Spot? It’s hard to imagine, but the original Echo arrived just a little more than three years. And in that time, Amazon has done a great job expanding what’s possible with Alexa and growing the Echo hardware ecosystem. While the Echo Spot isn’t for everyone, it fills an important place in the Echo lineup. It provides a way for buyers to take advantage of the additional features of the touchscreen and camera for substantially less than the Echo Show and just a bit more than the second-generation Echo. Thanks to that, the Echo Spot may quickly become the Alexa device of choice for anyone looking for an alarm clock that can do a whole lot more than just tell the time. Will you be purchasing an Amazon Echo Spot? What other questions do you have about the newest member of the Echo family? Let us know in the comments. Explore more about: Alexa, Amazon, Amazon Echo, Video Chat / Call. Do you only need the echo spot and the app for it to work? What other pieces do you need? The article says the alarm can be turned off by swiping the screen, can you snooze the alarm by touching the screen? I’d prefer not to have to use voice to snooze and disturb my wife. I have access to a few Echo Shows and I will say that they don't really do anything special aside from being dedicated video chat devices. Yes, get textual news throughout the day and it flashes my calendar at me periodically, but I almost never remember that it's there unless I have a video drop-in. The Show doesn't even do Youtube and I have yet to find any third-party video skills via Alexa that are interesting enough to get me to sign up for some other service. Given the cost of the Shows, just like with the Echo vs. the Dot, the Spot is clearly going to win on value. 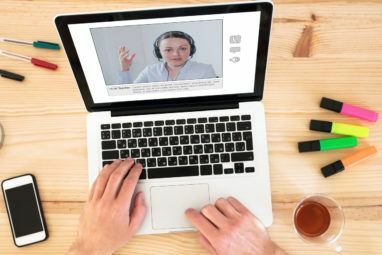 I will say that video drop-ins are pretty great and fuss-free, and I kind of like having it on a dedicated device placed at an angle I can easily control. But there's no reason to get a Show when a Spot does all the same stuff, just on a slightly smaller screen.